Configuration requise: Model Paint 42 3.9 est compatible avec iPadAir3-iPadAir3, iPad73-iPad73, iPad612-iPad612, iPadPro-iPadPro, iPadAir2-iPadAir2, iPhone5s-iPhone5s, iPhone7Plus-iPhone7Plus, iPhone6s-iPhone6s, iPhoneXS-iPhoneXS, iPhone7-iPhone7, iPhone6Plus-iPhone6Plus, iPad834-iPad834, iPadPro97Cellular-iPadPro97Cellular, iPadMiniRetinaCellular-iPadMiniRetinaCellular, iPad71-iPad71, iPad72-iPad72, iPadFourthGen4G-iPadFourthGen4G, iPadFourthGen-iPadFourthGen, iPadMini5Cellular-iPadMini5Cellular, iPad856-iPad856, iPadAirCellular-iPadAirCellular, iPhone5-iPhone5, iPad74-iPad74, iPadPro97-iPadPro97, iPad75-iPad75, iPadMini3Cellular-iPadMini3Cellular, iPad76-iPad76, iPadMini5-iPadMini5, iPhone5c-iPhone5c, iPadAir3Cellular-iPadAir3Cellular, iPhoneSE-iPhoneSE, iPad611-iPad611, iPhone6sPlus-iPhone6sPlus, iPhone8Plus-iPhone8Plus, iPad878-iPad878, iPhone8-iPhone8, iPhoneXR-iPhoneXR, iPhone6-iPhone6, iPadAir2Cellular-iPadAir2Cellular, iPadMini4Cellular-iPadMini4Cellular, iPadMini4-iPadMini4, Watch4-Watch4, iPadMini3-iPadMini3, iPadAir-iPadAir, iPadProCellular-iPadProCellular, iPodTouchSixthGen-iPodTouchSixthGen, iPadMiniRetina-iPadMiniRetina, iPad812-iPad812, iPhoneX-iPhoneX, iPhoneXSMax-iPhoneXSMax. Android et Windows Phone sont pris en charge pour accéder à cette page via flatforms. 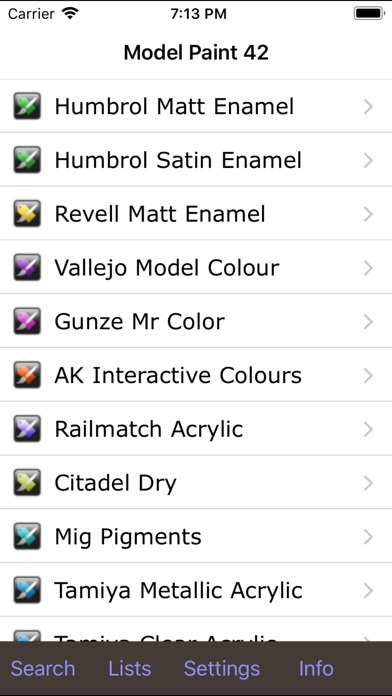 A database of over 7500 paints from 25 manufacturers designed for modellers. Whether you model aircraft, ships, railway, cars, trucks, boats, figures, wargames (in fact anything!) this database is for you. You can turn each manufacturer and range (e.g. 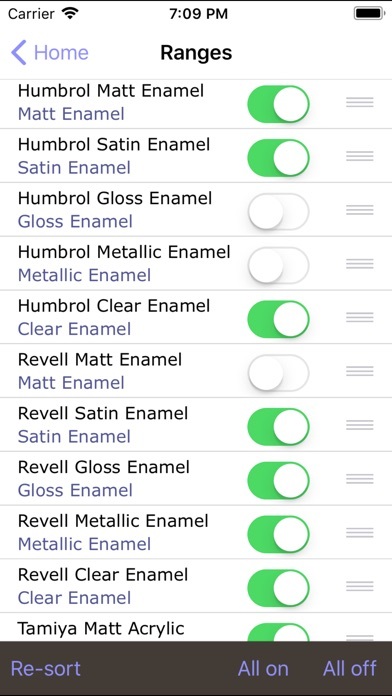 Humbrol enamel) on or off at any time so that you see only the lists you want. You can see details of each paint plus equivalent colours from all the included ranges. 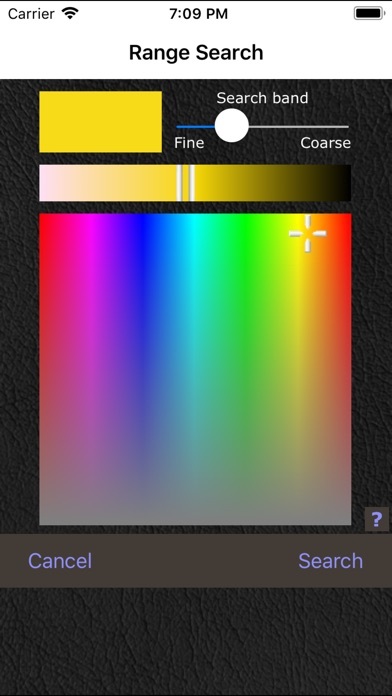 Or you can select to see equivalents from only the ranges you have switched on, the same medium or the same finish. 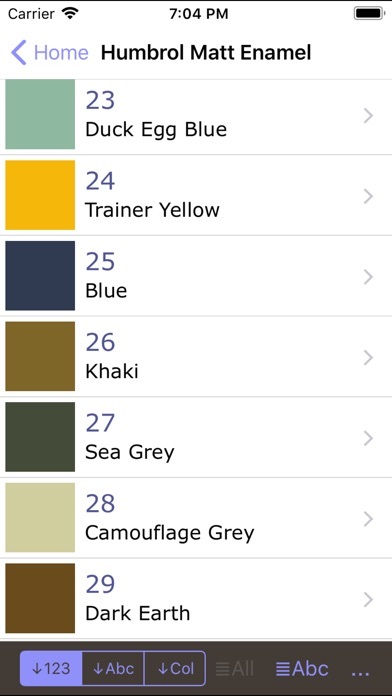 You can search across all the paints by colour, name, code, manufacturer, finish (e.g. gloss, matt), paint type (e.g. acrylic, enamel) and paints you have in stock. You can create your own lists from any paints in the database. You can lock the lists (to save accidental changes) and these lists can be set as stock lists (you have these paints). You can make notes against the list itself or the individual colours and you can sort the lists and colours any way you want. Paints you have added to any of your stock lists are indicated in the ranges, the equivalents and the search results so you can see what paints you have when you do a search. Saves a lot of wasted money buying the same colours twice and handy when you go shopping (you can have a shopping list too)! An invaluable reference database for any modeller.